Make the garlic butter, place into a bowl soften butter, chopped parsley, chives, basil and crush garlic set aside. Microwave potatoes for 6 minutes, once done cut the potatoes in half place into a bowl, add parsley oregano salt and pepper. In a large pan over high heat add one 1tbsp Vegetable oil, once the pan is hot add the potato's cook for 3 minutes turning over once golden brown, cook the other side for 3 minutes or until golden brown. Add cubed butter turn down the heat to medium and cook for a few minutes until well coated. Set the potatoes to the side. Wipe the pan out with paper towel. Return the pan to the heat, add 1 tbsp vegetable oil. Season the steak. Once the pan is hot, seal the scotch fillet for 4 minutes both sides, this will be a medium steak. Right before the steak is done add the potatoes back into the pan to bring the heat back into them. 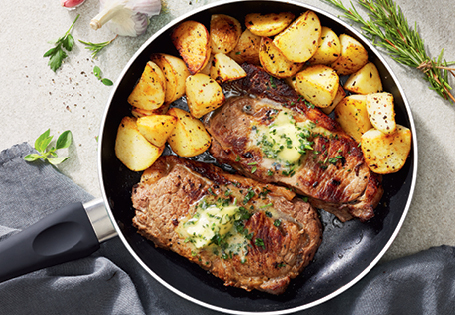 Smear garlic butter over the steak until melted and serve immediately.